Mr. Hurley received his undergraduate degree from the State University of New York College at Fredonia in 1998. He attended law school at the State University of New York at Buffalo and received his law degree in 2001. He is admitted to practice law in the State of New York in all Federal Courts in New York. 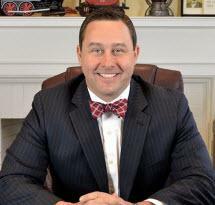 Additionally, he is admitted to practice law in Federal Courts in the Eastern and Western Districts of Michigan. After graduating law school Mr. Hurley began his legal career at the Erie County District Attorney’s office where he handled all areas of cases from violations through homicides. In 2006 Mr. Hurley left the Erie County District Attorney’s Office, where he was a member of the Felony Trial Bureau, and began focusing his practice in personal injury and criminal defense. He has handled numerous cases including automobile accidents, motorcycle accidents, construction accidents, and premise liability cases in furtherance of his personal injury litigation. Additionally Mr. Hurley has continued his practice in the criminal law arena handling all felonies, misdemeanors, violations, vehicle and traffic and DWI defense. In addition to the aforementioned practices, Mr. Hurley’s practice also includes representation of injured railroad workers and their families under the Federal Employers’ Liability Act. He has successfully litigated cases for injured railroad workers throughout the Northeast and has developed a number of relationships within various unions in the rail industry. He also has current family ties within the rail industry that have not only held union positions that helped further the rights of railroad workers, but have been injured on the job. By working closely with his clients, Mr. Hurley has been provided with the detailed insight of the needs of injured railroad workers and their families throughout the course of litigation and after.